If you are one of the millions of Americans who is currently uninsured we would like to introduce you to a healthcare solution designed specifically for you. Chances are traditional health insurance is too expensive or pre-existing conditions have resulted in you being turned down for insurance. We want to solve both of those problems for you right now. The GHM Benefits package is real health insurance. We work only with the top health care providers in order to assure a quality coverage. Our simple online sign up process will match you with excellent insurance providers in your area, and get you IMMEDIATE coverage for you and your family. 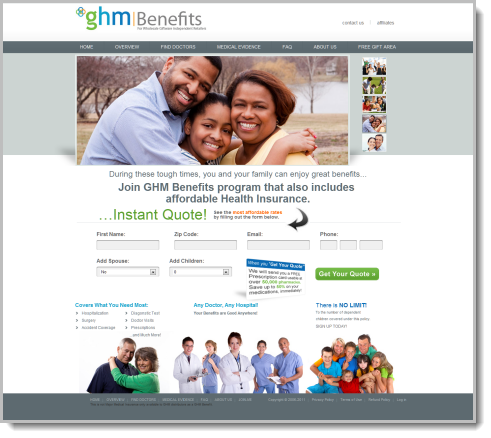 GHM Benefits is a perfect healthcare solution for small businesses. With GHM Benefits you are able to define how much of your employee’s benefits you will cover. Use benefits as incentive for performance or as a reward for extended employment. This is the most affordable healthcare solution in the America. Get a quote to compare prices and see how much you are actually saving. The information below walks you step by step through the coverage details of your new health insurance plan. Sick visits, exams, x-rays, lab work, ambulance, screenings, daily in hospital, all covered under the plan and much more. Covers most medications and provides significant discounts on the prescriptions Americans need the most and use all the time. Medical services required in an injury are covered under the plan. When you get a quote, you will see a chart of benefits listing the discounts and savings that come with your plan. The best part is that you can sign up today completely online through our agent-less enrollment platform. Our online quote system saves you money on your premiums! Get your quote today!